Robert Mancini has long championed the notion of universality within a football team and he is trying to implement his ideals into his Manchester City side: basically creating a fluid 4-2-3-1/4-3-3/4-2-4/4-5-1 depending on the context of the game. Defensively the shape is relatively normal for teams within the modern game, with a cohesive back 4 playing with (typically) Nigel De Jong and Gareth Barry in front of them. The full backs have license to push forward and provide width as there is cover for them to do so, Gareth Barry plays a very English version of a regista whilst Nigel De Jong is a typical midfield destroyer. Ahead of these 6 is where Manchester City differ from other teams. They play with a very fluid front 4, comprising of a false 9 with two players either side and then someone as the front pivot of the midfield triangle. When the team loses the ball the forward will push up against the centre backs and play as a number 9 whilst the wingers fall back and help defend. The midfield pivot will defend which ever flank is being attacked, basically providing a one-man shield in front of Barry and De Jong, or the full back. In essence, they fall into what is a very defensive minded 4-5-1 and one that is difficult to break down – as Chelsea recently found. However when the team is attacking we see the systematic lay out of a centre forward, an attacking midfielder, a trequartista (or rather a very 21st century version of one) and a winger. These roles are inter-changeable within the framework of the side, with the idea being to cause the defending side a problem inasmuch as it is very difficult to know who or how to mark them. Essentially, all 4 players are deemed capable enough of playing any of these 4 roles. Whether Manchester City do indeed have 4 players who can play all 4 roles is obviously a different question. 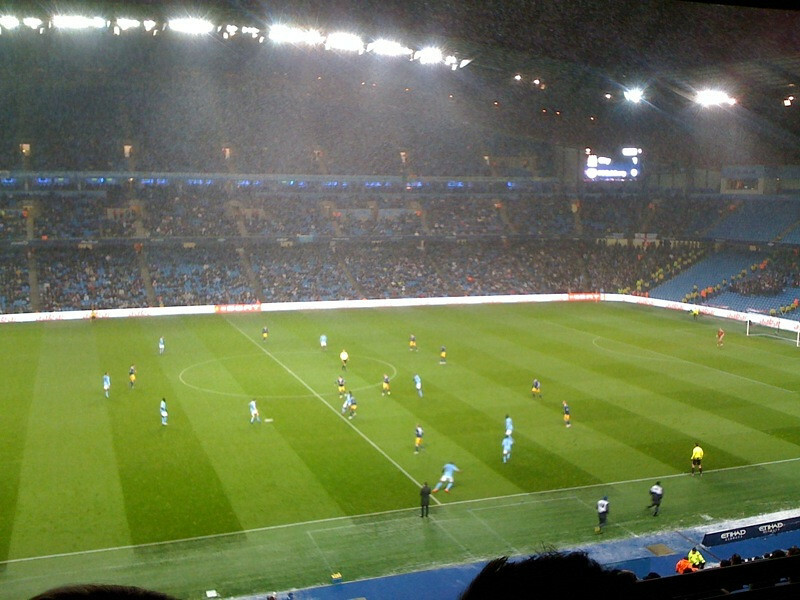 In spite of this, however, Manchester City aren’t a very romantic side to watch, they are indeed very pragmatic. Mancini’s ideology seems to be to wear teams down, in a similar way to Rafael Benitez, with developed patterns of play and essentially oppressing the opposition defence into giving up chances, rather than through creative endeavour. The two most interesting aspects of the attacking tactics used by Mancini are the attempted re-development of two footballing traditions that are, seen to be, dying off. The first of these is the usage of a trequartista. David Silva’s role within this front 4 is to drift in field and to create opportunities for his other attacking team-mates. His drifting in from the right helps to defeat the age-old problems of the trequartista, namely that he gets marked out of games and thus the teams creative force is shut down. Of course, within Mancini’s universality Silva isn’t the only player who fulfils this role. Carlos Tevez regularly drops into the space in front of the centre backs and helps to create chances for his team-mates, which affords David Silva the opportunity to put himself forward into more advanced and dangerous areas. One of Manchester City’s main drawbacks so far this season has been that in many instances Yaya Toure has wound up in a enganche-esque position and, although he is a talented player, he is not a natural born creator and causes attacks to stagnate when he finds himself in this position. One of the pivotal natures of the trequartista is for him to be in that space and for him to have other players to create for, so when Yaya Toure gets the ball in this position Tevez and Silva’s natural inclinations are to get forward, leading to these situations where a player who isn’t naturally creative is left in charge. And even if Silva or Tevez did drop deep to collect the ball, they find themselves dropping into a part of the pitch which is stifled by defending players who will be drawn to Yaya Toure. A lot of credence has been paid to Adam Johnson’s recent omissions from sides in favour of David Silva, but the fact he doesn’t contribute as much creativity as Silva means he will probably be restricted to an impact sub role under Mancini. He is too one-dimensional to function within such a fluid system that has the directive of being inter-changeable, and Johnson’s Robben-lite abilities may prove to be his un-doing in the long term. The other role that is being reincarnated in this system is that of a box-to-box midfielder with Yaya Toure taking on a great deal of attacking intent as well as defensive workload. Even though Toure doesn’t necessarily get into the box as much as a typical box-to-box midfielder he is a vital prong of the Manchester City attack. His physicality combined with a fairly deft touch for such a big man provides Manchester City something they do lack when going forward, and that is presence, especially when for instance Tevez, Silva and Johnson line up for them. An increased onus may be placed on Toure as time wears on to push forward into the box. He certainly has the athletic ability to do so and provide a big problem for defences if he arrives at the right time. It certainly seems to be an answer as he doesn’t have the right characteristics to play in the enganche position he regularly seems to find himself in at the moment. One of Roberto Mancini’s biggest problems over the course of the season is going to be justifying his methods if City falter. With playing a formation that can be essentially seen as playing one or no striker at all he is going to be wide open to flak from the media and fans alike if the goals dry up, especially if he does continue to sideline Adam Johnson for his direct nature, which seems to have made him the new darling of the English game. That said, one can only imagine that they will become a much more potent entity once you put Mario Balotelli and Aleksander Kolarov into the mix. I don’t get the logic of this “inverted triangle” in midfield. It is too easy to pass around and asks too much of Yaya. Mancini needs to have more faith in Silva and play him in the hole. His mobility and tendancy to drift to the flanks makes him very difficult to mark as he has shown in some games. Silva is a defensive liability when played as a right winger unless you have a very attacking right back, which Man City dont. By trying to make his team less predicatble, he has done the opposite. Perhaps, but you get the safety of the double pivot and playing Toure in that withdrawn position should also, in theory, drag the opposition’s holding midfielders up and create more space for Silva to come inside.